The latest mix in the GETME podcast series comes from Anna Lann, the conceptual interdisciplinary audio-visual artist, composer, producer and DJ who works in a variety of mediums, from visual arts and sound-design to film, performance and installation art. In her practice, she explores philosophical and scientific notions, using surreal situations to examine the boundaries between reality and fantasy, pushing the limits between object and subject. Psychemagik release Undercover Lovers, a selection of obscure cover edits from Psychemagik. For Mehmet Aslans’s latest EP on Basel's Planisphere Music, he delivers arguably his most detailed and intriguing production to date. Sampling Turkish singer-songwriter Deniz Tekin’s performance of the traditional Roma folk song ‘Ederlezi’, a centuries-old standard among the Romani minority. Ruf Dug gets the remix treatment from Sharif Laffrey on his latest Futureboogie release. Catch up on Justin Roberston’s latest Temple Of Wonder on Soho Radio. Manfredas brings us the latest instalment of the long-running Deep House Amsterdam podcast series. Enjoy an hour of Manfredas on the NTS airwaves. Re-live Mr Weatherall joining Joe Hart & Scott Fraser at Body Hammer down at their home The Pickle Factory. Catch up with JD Twitch’s power hour on Rinse FM as party of the Optimo Music takeover. Re-live Autarkic’s sonic trip recorded live and direct from ADE on Red Light Radio. Mehmet Aslan with the latest podcast for Italian institution Soundwall. Manfredas' contributed a power hour for Wilde Renate & Else’s Rinse FM takeover. We happy to announce another addition to the family as Sharif Laffrey joins us here at Spun Out. A true lynchpin on the Detroit underground music scene, Sharif has been DJing internationally for over 20 years with his roots firmly in the motor city. His most recent productions have seen the light on highly regarded imprints ESP Institue, Love On The Rocks and Discos Capablanca, whilst Sharif continues to head up his own label Special Forces. We're really excited to welcome Anna Lann into our Spun Out family. A kaleidoscope of creativity, Anna is an adept DJ, producer and singer-songwriter, creating dreamlike cosmic pop music one minute and downtempo techno weirdness the next. It's with great warmth and joy that we welcome Body Hammer into the arms of our Spun Out family. 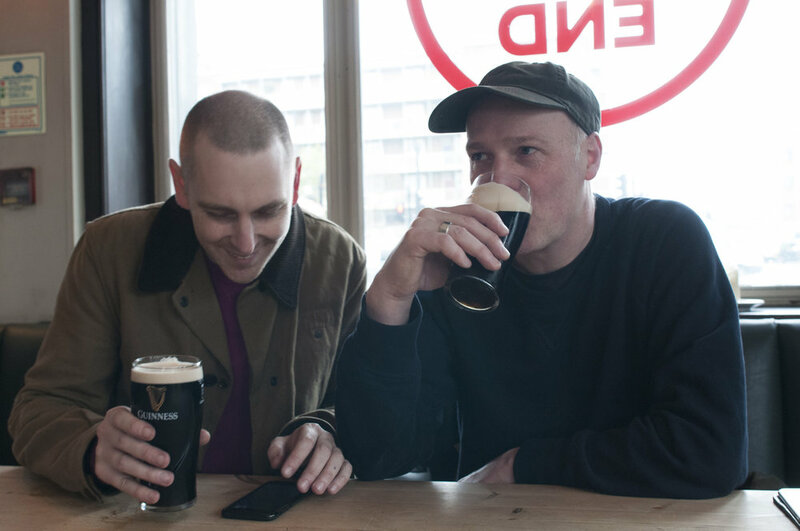 Comprising of duo Joe Hart & Scott Fraser, the London pair are inspired by the raw simplicity of early house music and their agenda is simple, to deliver dance music in its purest form. Their parties don't feature guest DJs, instead allowing Joe & Scott ample time to flex with long b2b sessions spanning the entire night and in doing so creating a dance floor with a certain energy and a certain soul, something that’s becoming harder to find in these days in London. Swiss-born Turkish DJ/producer Mehmet Aslan delivers a deep, atmospheric slow-burner on Bobby Pleasure’s Needs (not-for-profit) label – joining Lord of the Isles, Petwo Evans and more, all proceeds go to the Help Refugees charity. Ghost Culture delivers a mix which sees him blend experimental club orientated music with an abstract, forward-thinking perspective for our friends over at Ransom Note. URSSS.com take us back to the Milanese woodland with an hour of Andrew Weatherall recorded live at Terraforma 2017. As a phenomenal DJ, producer, label owner and party starter, Scott has earned the reputation of being one of the leading figures in London’s underground electronic scene, constantly contributing with his expansive work over the years. Enjoy this brilliant mix Scott has kindly put together for us, and expect much more of this at the Festival this summer as he joins A Love From Outer Space, Timothy Clerkin and more on the Ransom Note takeover. Whether it’s chugging cold wave, slo-mo electro or warped neo-trance, the music Manfredas writes and spins maintains a wild off-kilter charm that makes him one of the most exciting DJ/producers on the planet right now. Recognise is DJ Mag's new monthly mix series, introducing artists we love that are bursting onto the global electronic music scene. This month they spoke to Lithuania's psychedelic party-starter Manfredas, you can check out the whole article here. Just hours before headlining the Sydney Opera House Andrew had a chat about his latest album, gig-day ceremonies and how he fell in love with music. For this mix Lokier recorded us almost an hour sounds cold and dark as the streets of present Berlin, with subtle touches of psychedelia and radiant electricity. The cave’s been opened – greet the bats with the third edition of PoVcast. Relive those Summer months with Optimo recorded live at Dekmantel Selectors. Listen back as Justin Robertson joined Nein Records for this months show. Whilst over in Amsterdam for ADE Lokier popped into Red Light Radio for a special power hour. Listen back to Marlon Hoffstadt live and direct from Chalet Club, Berlin. We're happy to announce that Ghost Culture has joined us here at Spun Out Agency! With a string of releases on Erol Alkan'slabel, including the highly acclaimed self-titled LP and this year's Nucleus EP, we can't wait to start working together. A new Ghost Culture album is in the making ready for 2018 and promises to be his freshest and most exciting music yet, so please get in contact with caroline@spuntoutagency.com for more info. Their first show on Gravity was one of key experiences in Vilnius nightlife according to Manfredas, who later also invited JD Twitch together with JG Wilkes. 20 years on stage seems like a proper reason to do it again. Manfredas drops a new podcast to help Salon - Zur Wilden Renate celebrate reaching a decade! Catch up with Autarkic making his Boiler Room debut in his native Tel Aviv. Its gives us great joy to announce that Marlon Hoffstadt has joined the Spun Out family! The Berlin based DJ and producer has already built up a ludicrously strong back catalogue since his first release in 2013, with EPs for the likes of Hot Haus Recs and his own Retrograde and Midnight Themes imprints, plus a new EP coming out on Ransom Note Records imminently. We can't wait to start working together here at Spun Out. Scott Fraser & Joe Hart aka Body Hammer head to the Pickle Factory for Halloween weekend, with the London institution becoming a regular fixture for the club going forward. Listen below as they deliver the latest installment of the OSM podcast series. Listen back to Manfredas joining Tim Sweeney on Beats In Space. We're happy to announce that Mehmet Aslan has joined the Spun Out Family! The Swiss born, Berlin based DJ and producer has strong Turkish roots, roots you can hear vividly in his releases, reimagining his ancestors' music and blending those traditional elements of classic folk music with contemporary 4/4 beats. For more information please get in touch with Caroline. Power, Corruption & Sighs - Ewan Pearson interviewed on The Quietus. Read here. A fresh DJ set from Autarkic on Teder FM. A full 6 hours of A Love From Outer Space recorded at Clandestino in Leeds. Scott Fraser with show #888 on Beats In Space. Optimo's JD Twitch played, "spiritual synth dub, DIY exotica and post-punk chanson", recorded live at brilliant corners for Resident Advisor. Listen back to Lokier guesting on the Diet Clinic show on NTS Radio. Ivan joins Tim Sweeney for this week's Beats In Space live from New York City. The 21th episode in the SoHaSo podcast series is marked by one of the illuminating figures within London’s underground Electronic Scene: Scott Fraser. This quite awesome live set from Autarkic recorded at Lux Fragil back in November. Timothy J Fairplay jumps on Red Light Radio for Dekmantel's weekly show. Manfredas opens up his bag for an eclectic selection for Edwin. We're happy to announce the Manfredas has joined the Spun Out Family! Andrew Weatherall 's full set from Leftorium in Beursschouwburg is now streaming for your audible pleasure. Coin Op vibes here for Timothy J Fairplay's video 'Autoduel'. New Autarkic heat on Disco Halal, Violence is the first track from his upcoming LP I Love You Go Away, out in April. Ivan Smagghe live from Paris insitution REX Club. Wrap your ears around this Balearic Rhythms cassette by Optimo's JD Twitch. Check out Joe Goddard's latest single Music Is The Answer from his new LP Electric Lines, released April 21. Check out clips of Timothy J Fairplay's debut album Where Is The Champion below. Autarkic's ace edit of Rave Zehava is up now available for a free download. It's A Fine Line feature on Tim Sweeney's best Of 2016 round-up on Beats In Space. Listen back to Justin Robertson's latest Temple Of Wonder's show on Soho Radio. Joe Goddard's remix for The Chemical Brothers has been nominated for Best Remix at this year's Grammys. Listen to Ewan Pearson's remix of Languages. Joe Goddard's new video for 'Lose Your Love'. Sean Johnston reveals a new mix for OCI Mag. Andrew Weatherall's label Moine Dubh and his Woodleigh Research Facility collaborator Alain Maclean feature on David Holmes' LateNightTales release.